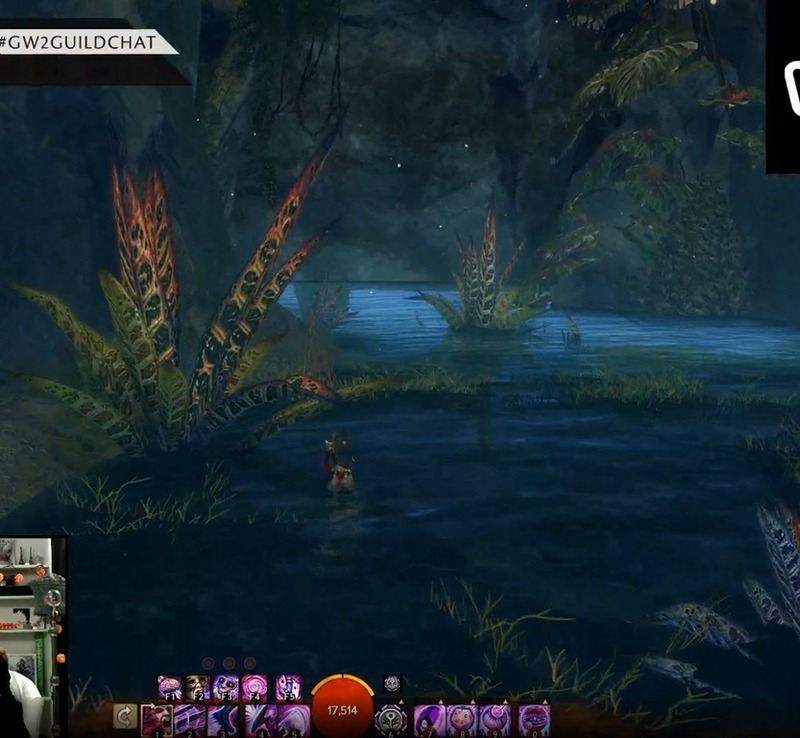 I’ve taken information and screenshots from various blog posts and livestreams to try to put together a reasonably comprehensive comparison of the two available Guild Halls coming with HoT. As a guild we’d like to take the opportunity to secure our hall and start upgrading it as soon as we can after launch and to do that we need to have a membership poll on which hall to go for. Available at HoT launch there will be cinematic tours of each hall available from the Guild Initiative Headquarters in Lions Arch – for you to view if you still need help deciding on which hall to go for. 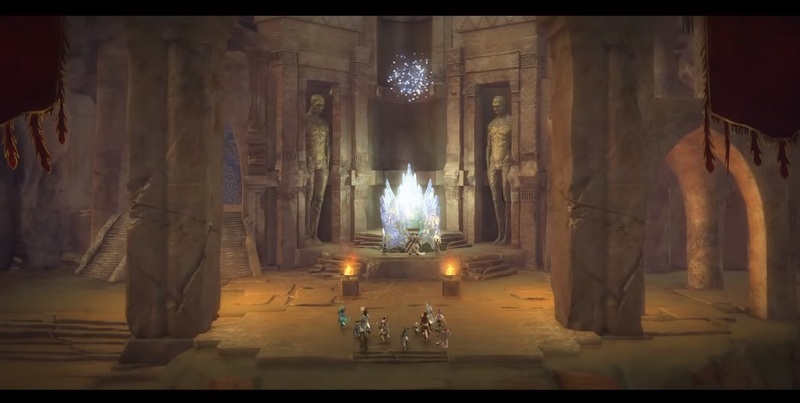 Guild Halls are large instanced maps that guilds can capture and own in order to play, battle, socialise and progress the guild facilities together. 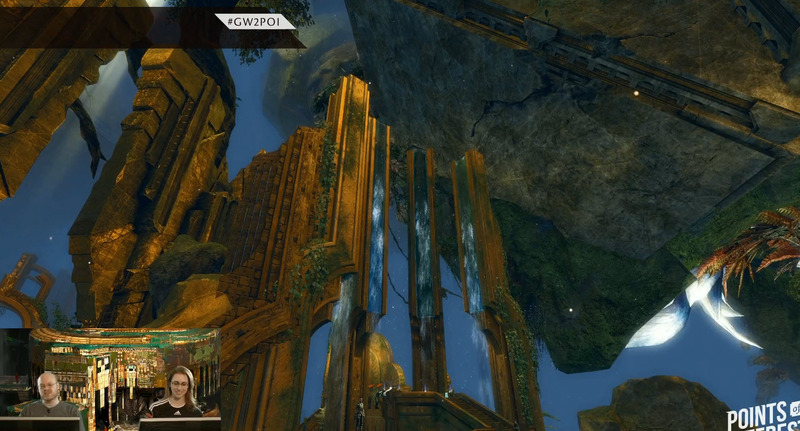 There are two Guild Hall maps coming with HoT, they are Gilded Hollow and Lost Precipice. 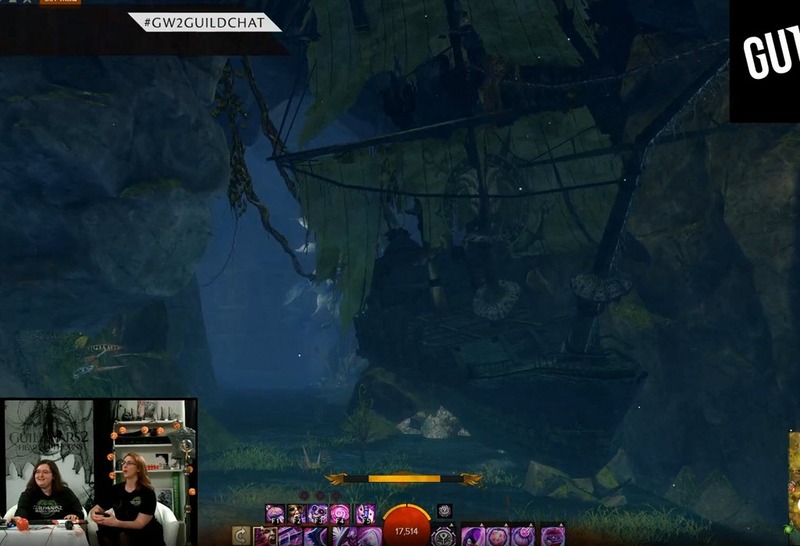 How do we get a guild hall? 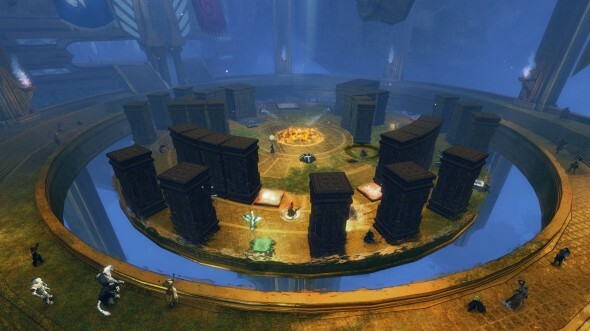 Guild Halls are overrun with Mordrem, in order to secure a guild hall the guild must mount an expedition in conjunction with the Guild Initiative in Lions Arch to assault the hall, clear it of Mordrem and claim it for your own. Expeditions cost 100g but you can keep trying until you successfully take your hall without having to repay if you fail an assault. Can I have access to both halls? 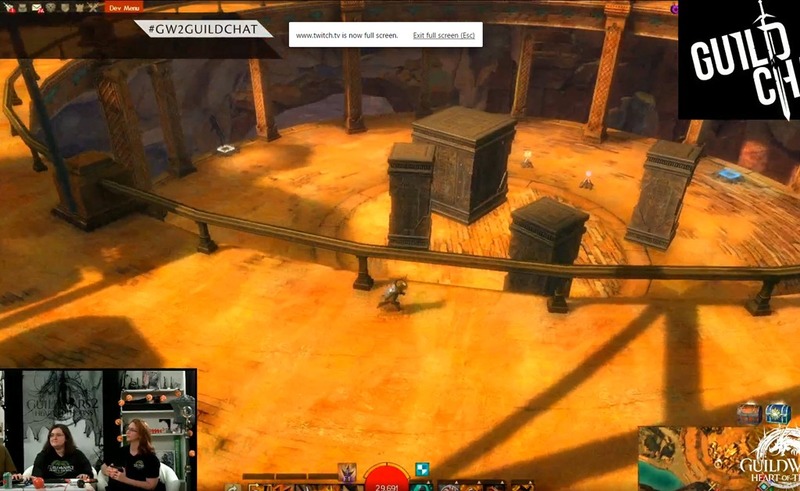 An individual guild can only hold one guild hall at a time. Should they wish to change to the other hall they must mount a new expedition (for 100g) and successfully capture it. At this time all hall upgrades will be transferred to the new hall and decorations will be returned to the guild for redistribution in the new hall. At the moment there is no way to save decoration layouts in an abandoned hall for you to return to it as you left it. If you wish to return to your original hall you must again mount an expedition (100g) to recapture it once more. As you can belong to five guilds at once you should be able to find a guild which has the other hall and you can access it and any associated resources that way – as long as you have the necessary permissions within that guild. I don’t own HoT, can I access the Guild Hall? Yes, however you won’t be able to participate in the expedition to capture a hall (as it involves travelling to HoT specific areas). 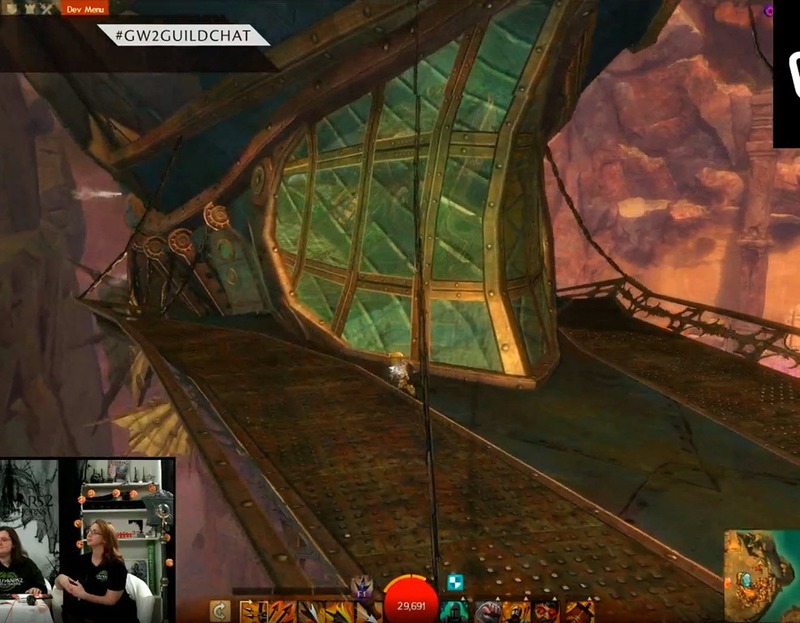 However, once your guild owns a hall you can travel there anytime from core Tyria (via the guild panel or through the Guild Initiative Headquarters in LA). You may not have access to some guild permissions if you do not own HoT (details a little sketchy at pre-launch). 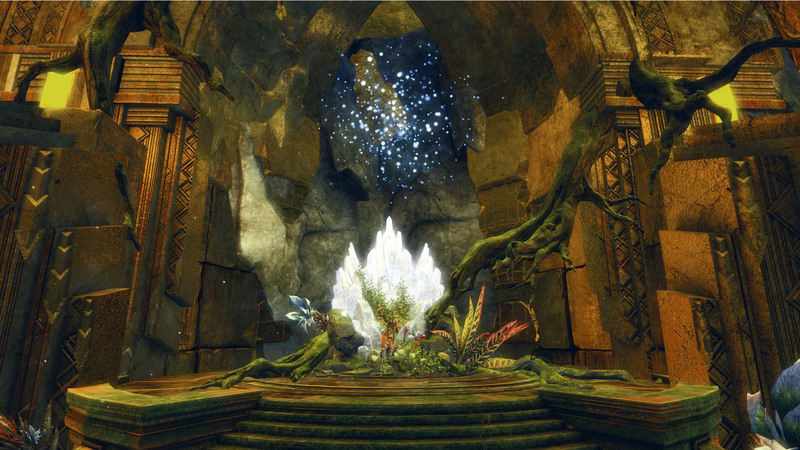 Each Guild Hall will contain the same six upgradeable buildings as well as other communal areas, secrets and siderooms. 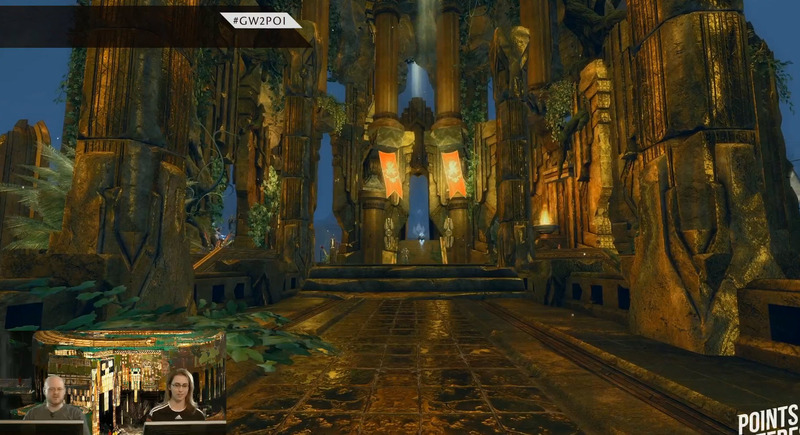 Each hall has a different environment/theme and you can use various methods in order to traverse these large maps. In interviews its been stated that to fully upgrade your hall will take between 6-9 months, due to time-gated resources such as aetherium and favor. 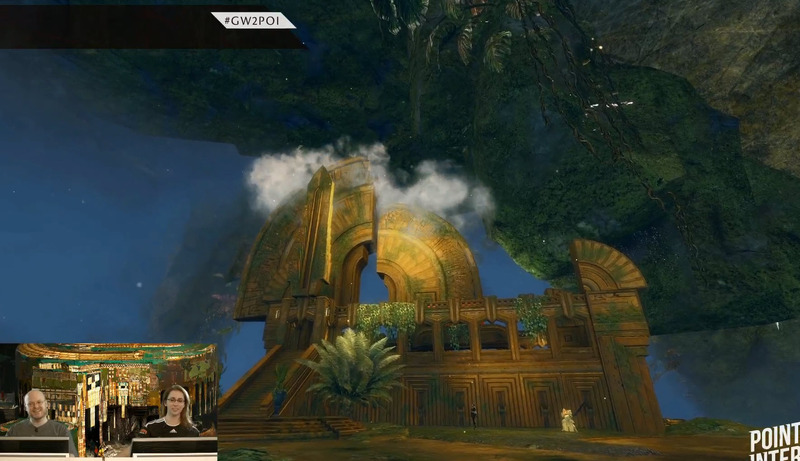 Gilded Hollow is described as a monolithic cavern containing the remnants of an outpost of the lost golden city in the heart of the jungle. The ‘immensely majestic’ golden ruins sit on top of an ancient aquifer, providing plenty of subterranean tunnels and nooks and crannies to explore in the lush micro climate. 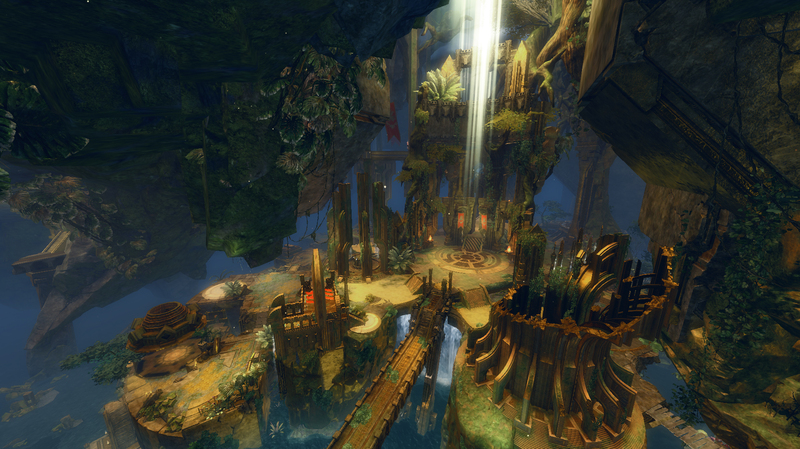 The primary buildings in Gilded Hollow are larger than those of Lost Precipice, or perhaps just on a grander scale. The guild buildings in Gilded Hollow are all centred conveniently around the central waypoint. 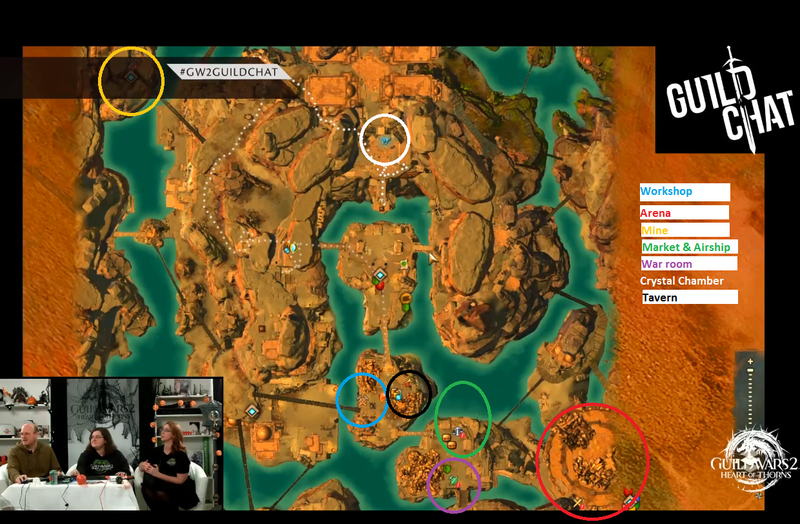 (The black areas on this map indicate some of the tunnel areas explorable below the ruins. 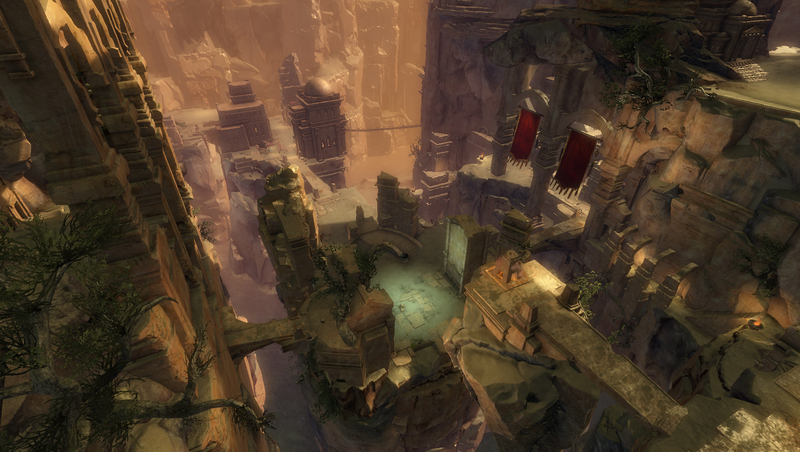 Described by one of the devs who worked on Guild Halls as “an absolute love letter to gliding and cliff diving” the Lost Precipice map is set in the ruins of a towering stone refuge clinging to the cliffs on the border between the Maguuma Jungle and the wastelands to the north. 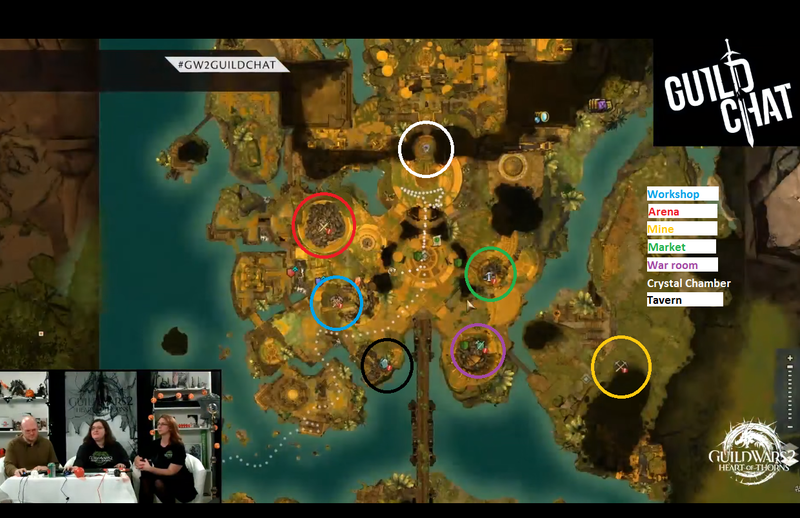 The guild buildings are slightly more spread out on this map and are also at different heights due to the verticality of the map. Each map has a number of waypoints for easy and quick travel. Gliding (mastery required) is also an important mode of transport, although probably more so in Lost Precipice than in Gilded Hollow. 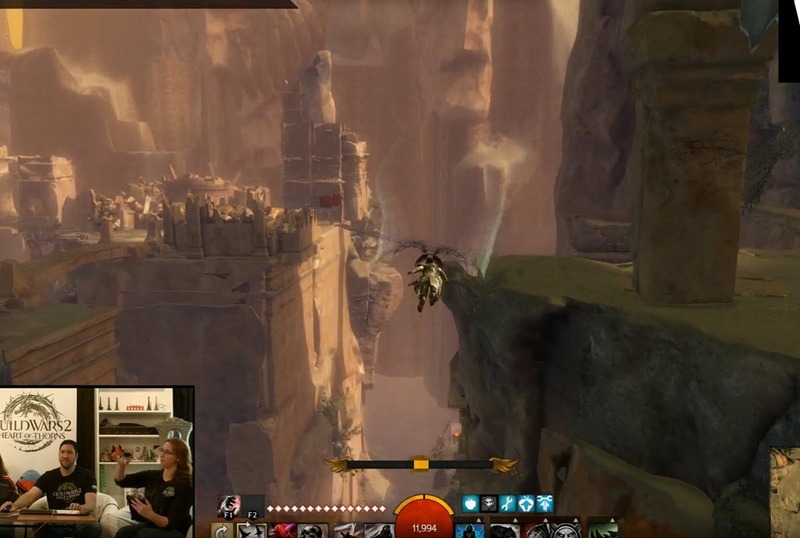 In Lost Precipice you will find jumping pads all over which provide updrafts for you to quickly navigate between the levels of the map with your glider. In Gilded Hollow you will find bouncing mushrooms (mastery required) on the floor of the cavern to help you get up to the level of the buildings with ease. Pre-launch we don’t have direct visual comparisons for all the upgradeable buildings and features of the halls, but we do have some although at different stages of upgrade. 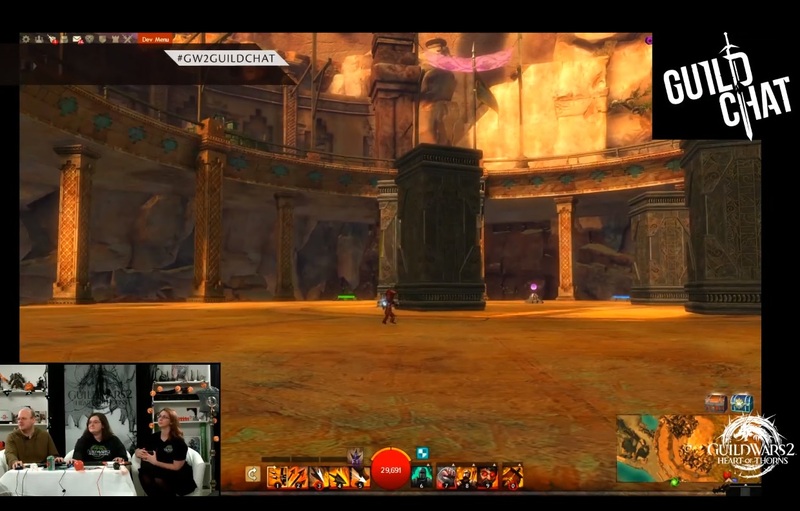 For those with an interest in PvP and GvG the following is a comparison of the two arenas available. It has been said that they are roughly the same size. Both can be ‘decorated’ to change the play of the arena, both have an edge that players can be pushed over and out of the arena (this can be prevented with a barrier). Gilded Hollow’s arena is set high above the main floor of the hall, with a narrow spectator ring around it and on roughly the same level as the arena itself but at a distance. 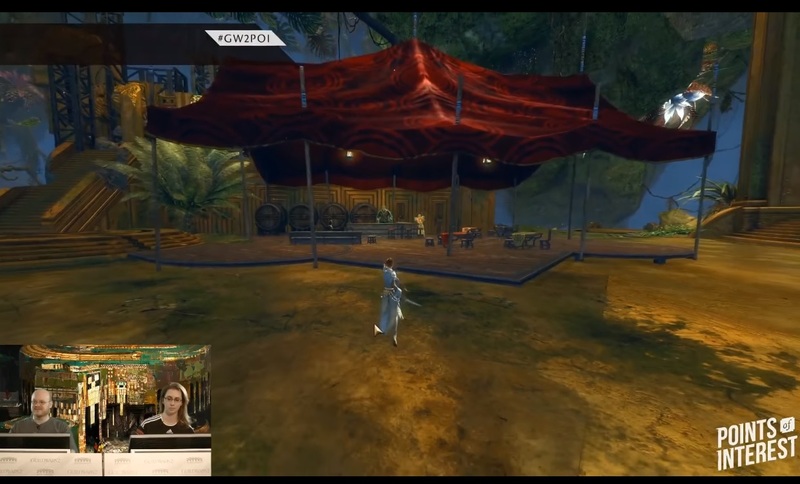 Devs have pointed out the the floor of the Gilded Hollow arena has markings which could be useful in types of play (ie. setting smaller arena space within for 1v1 or for more accurately placing props, etc). 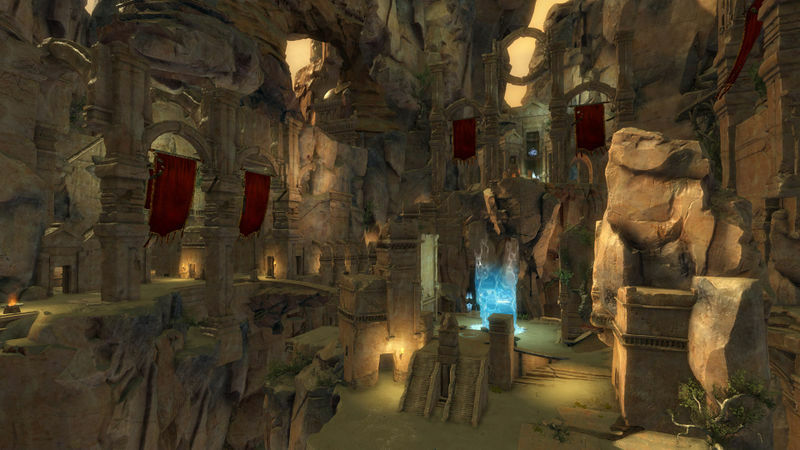 The Lost Precipice arena is more ‘gladiatorial’ in design, set below and slightly under the spectator area, with pillars around the edges and offering potentially less clear lines of sight. I’ve not got a screen of it upgraded but without player placed obstacles – the pillars around the edge are always there, they cannot be moved or removed. Both taverns have been featured although the one for the Lost Precipice has only been shown in its first tier of upgrade. Taverns are where you will be able to choose your guild anthem to play during your Guild’s moments of triumph! Inside the Gilded Hollow Tavern – Kodan barman provided! Not many of the other buildings have been shown as complete, but here’s some screenshots to help you get a feel for each of the halls. 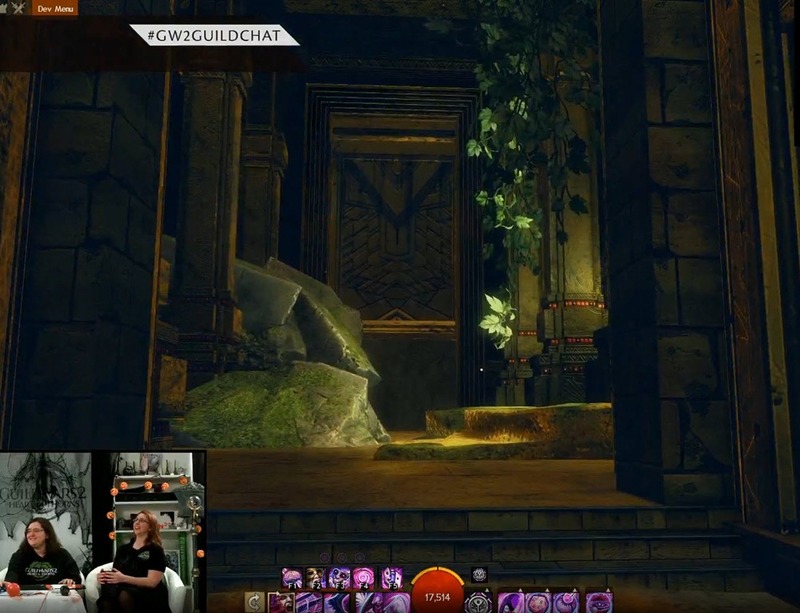 The Crystal Chamber – capture this and you capture your hall. 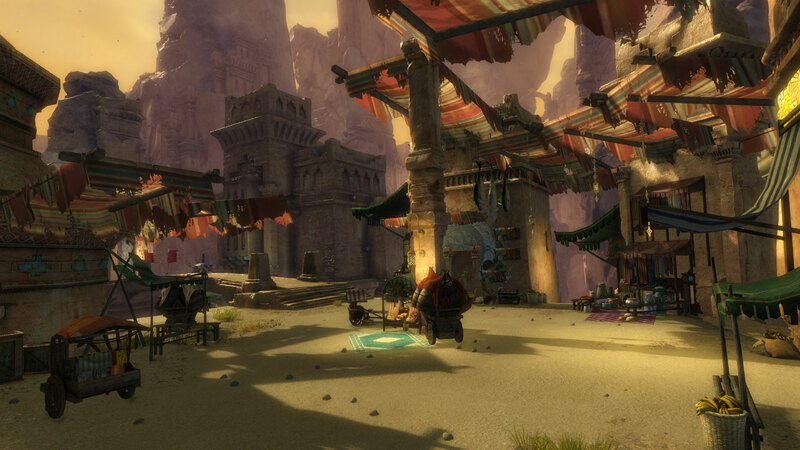 Lost Precipice’s fully upgraded Market comes with its own Airship! 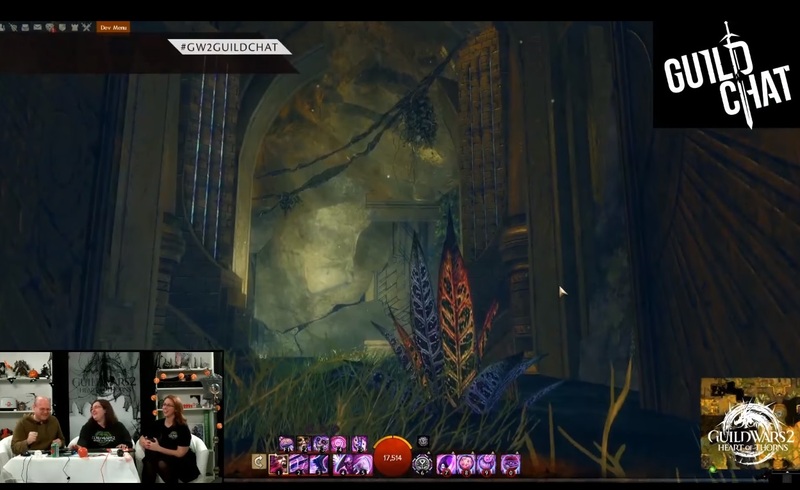 The latest installment of Guild Hall news via livestream showed us some of the areas of the map that could be used for guild members to stake out a little corner of the map for themselves. There’s no doubt much more on these massive maps yet to be shown but here’s some screens to give you an idea. From what’s been shown it seems that Gilded Hollow has more open communal space that can be occupied and decorated, whereas Lost Precipice has more small rooms or chambers dotted around the cliffsides. 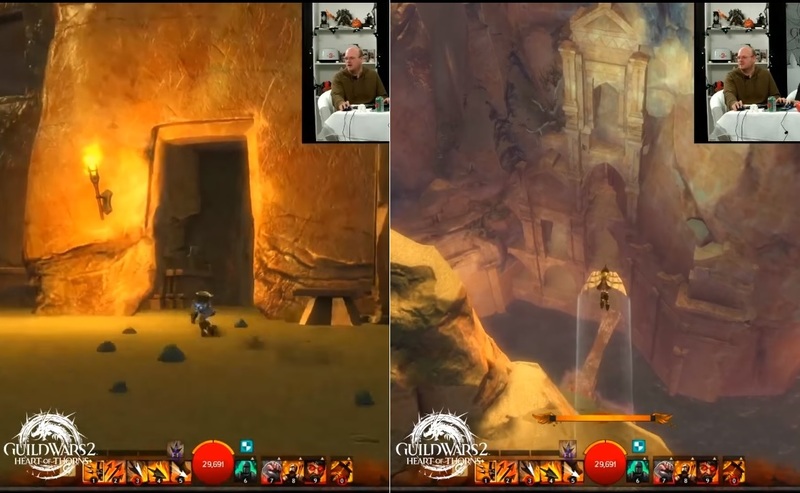 Previous coverage from the devs suggests that Gilded Hollow is easier to use large decorations in as it has more flat area (needed for placing decorations) and perhaps more scope for building your own jumping puzzles within the hall. 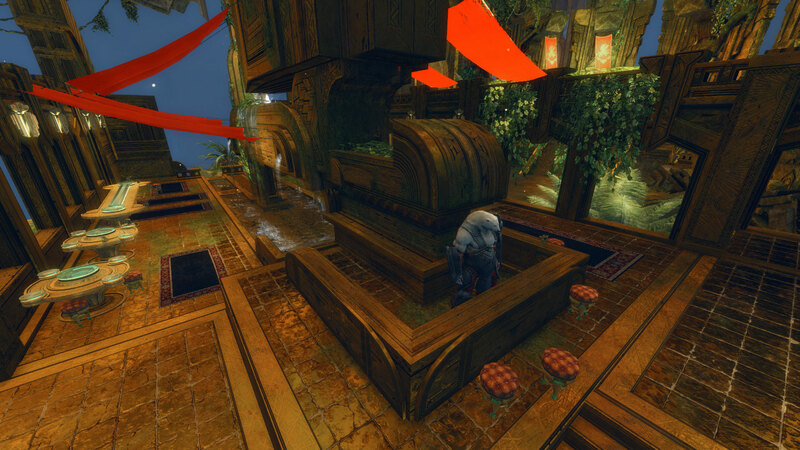 Subterranean nooks and crannies offer opportunities for player housing. 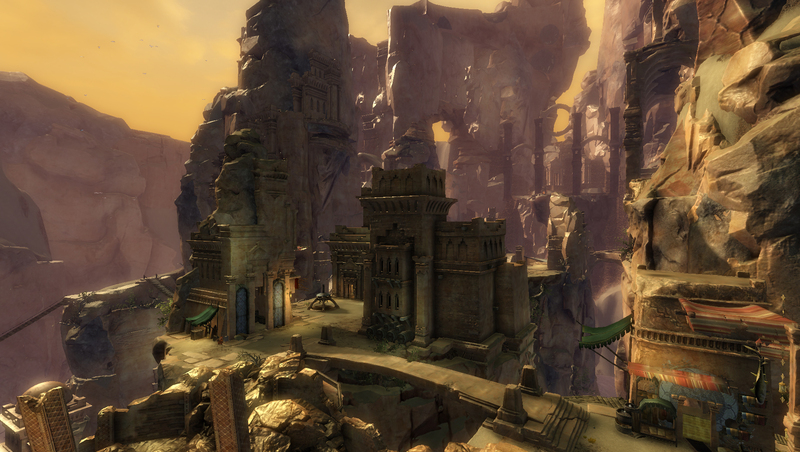 Lost Precipice has plenty of unoccupied stone buildings and cavates for players to claim. Although we don’t know the specifics for either crafting or purchasing these new weapons and armour they seem to be tied to Resonance, a new guild currency you can earn from missions. 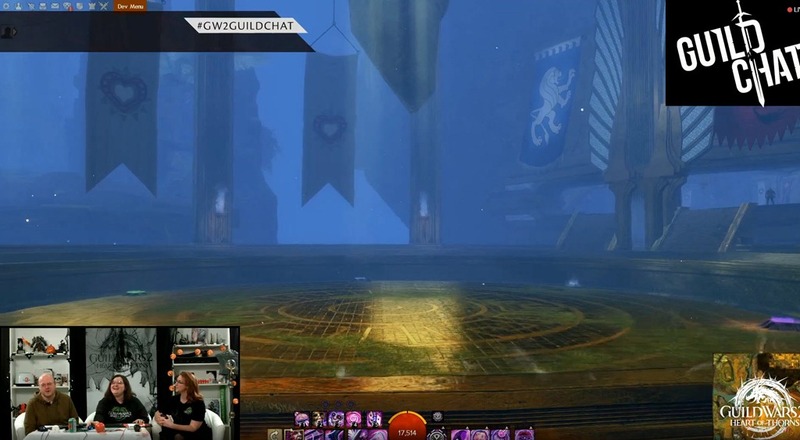 In the Guild Week Q&A Colin clarified that your guild will not need to swap halls in order to obtain both sets, however you will need to visit both halls to access the unique vendors in them for additional ingredients. So you just need to find a guild with the other hall and visit it to find the vendor. They have shown some of the skins in demos. They can be see at the end of this Dulfy post. The Tenebrous set comes from Gilded Hollow and the Shimmering set from Lost Precipice. Access to the vendors comes from upgrading the Market building. Here’s all the pre-launch blogposts relating to guilds and guild halls.